Like many Nevada towns, Tonopah began life as a mining town. In 1900, the discovery of silver brought many prospectors to the area and the town boomed. Although the silver soon ran out, the mining history of Tonopah remains. Tonopah is home to the Central Nevada Museum, an excellent free museum that provides information and displays about the mining history of the area. Numerous mining artifacts are on display at the museum, too. 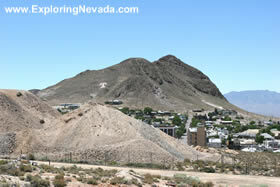 Tonopah is also home to the Tonopah Historic Mining Park, which is located on a hill outside of town at the site of the original mining claims that started the silver rush. In addition to having numerous displays and information about the mining in Tonopah, the Mining Park also offers underground tours that lead down old mine shafts. The largest employer in Tonopah is the Tonopah Test Range. This test site has been used for a wide variety of purposes by the military, from nuclear testing to the development of the F-117 Nighthawk. With an elevation of over 6000 feet, the weather in Tonopah defies its southern location. Summer weather is sunny with high temperatures in the 80’s and low 90’s. And winter weather ranges from cool to cold, including enough snow to make travel interesting at times across the passes on US 95. Tonopah has an excellent location for outdoor interests. Just to the east of town, on US Highway 6, the beautiful Big Smoky Valley Scenic Drive begins. The rugged and usually snow-covered Toiyabe Range, home to the Arc Dome Wilderness area, lies less than an hour away to the north of Tonopah. Additionally, many of the other isolated and remote mountain ranges in Nevada, such as the Monitor Range and Toquima Range, are an easy drive to reach. 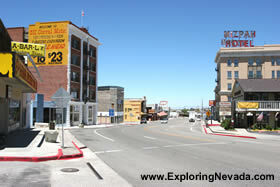 Tonopah has several hotels in town, along with a number of restaurants. For those taking adventage of the outdoor pursuits in the area, Tonopah is the best place to stock up on gas and supplies, too.